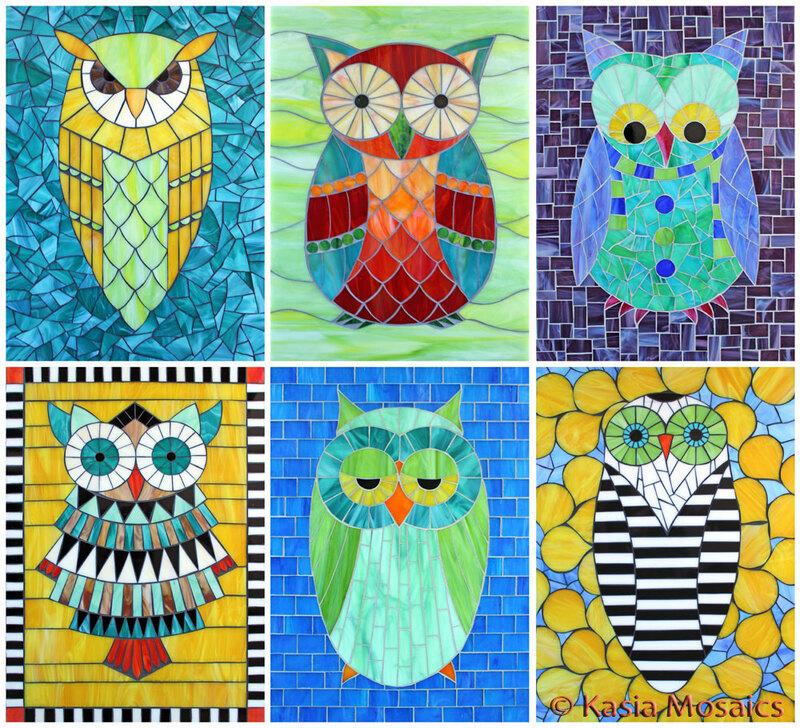 Watch the class preview below to get a glimpse into Kasia's New, exciting Online Owl Workshop. This online course is not a basic couple hour class. 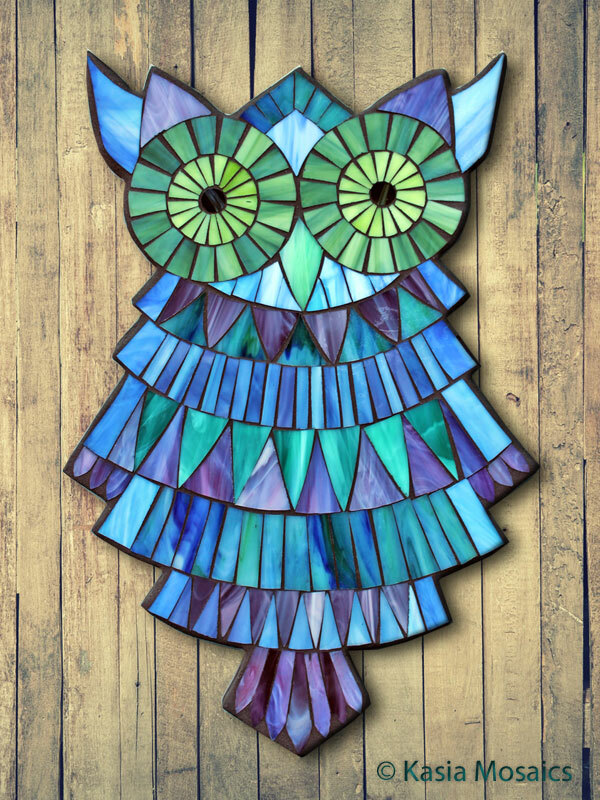 It is a full length course where the students can immerse themselves in learning while creating a full set of owl mosaics while developing a very strong foundation in stained glass mosaics for indoor and outdoor while perfecting their glass cutting and shaping skills. 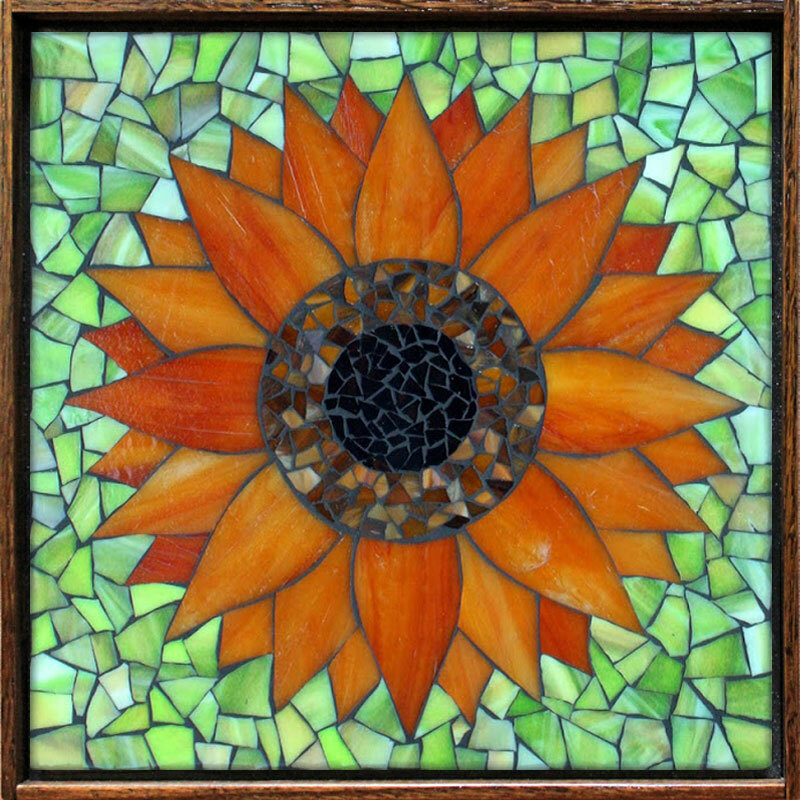 This is a great option for beginners as well as intermediate mosaic enthusiasts who are serious about learning a new art form or improving their craft. 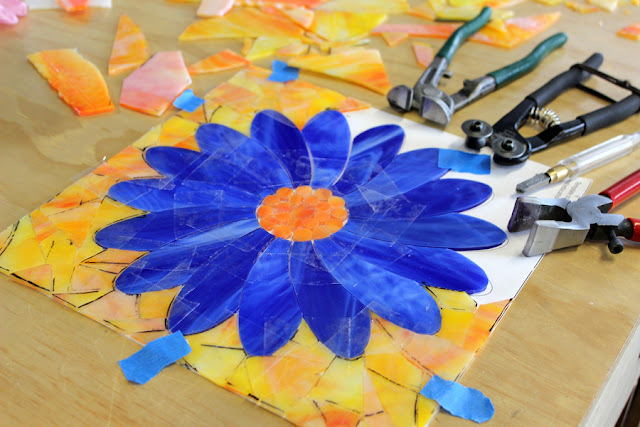 Students will receive instant, lifetime access to the course material from anywhere in the world. 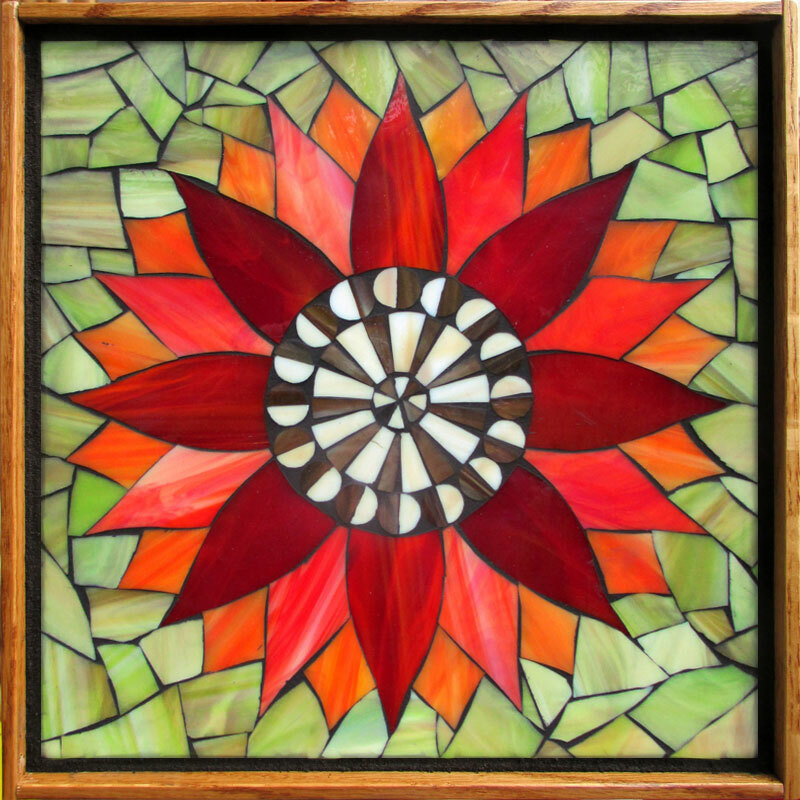 The class comes with 8 project templates with individual tips and tutorials in addition to the full length class which can span over months of time if properly taken advantage of. 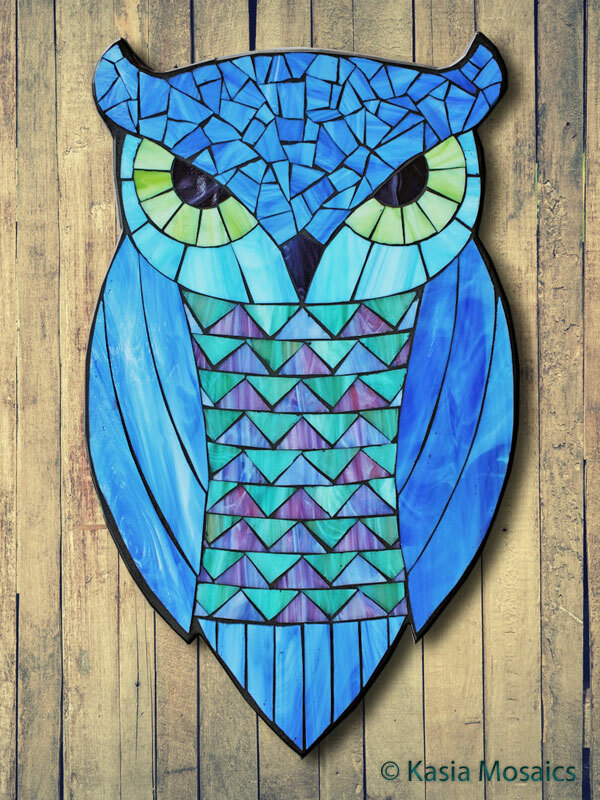 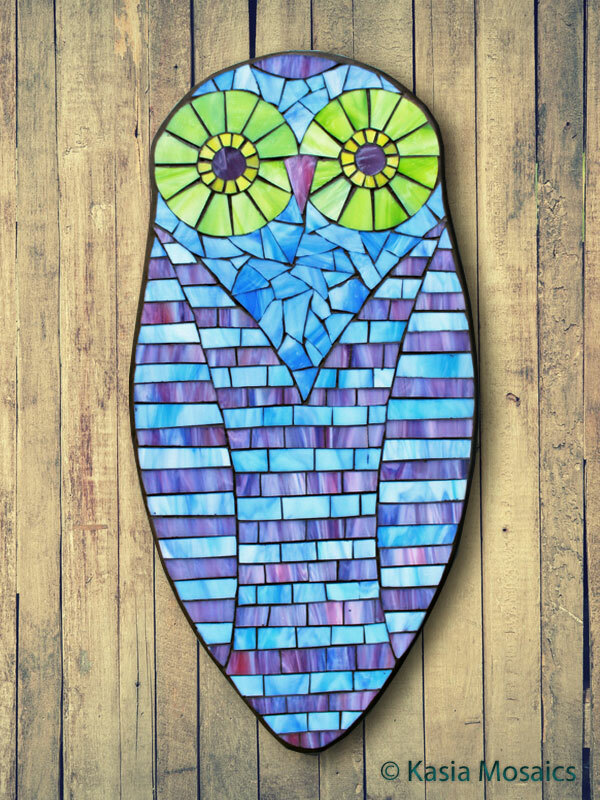 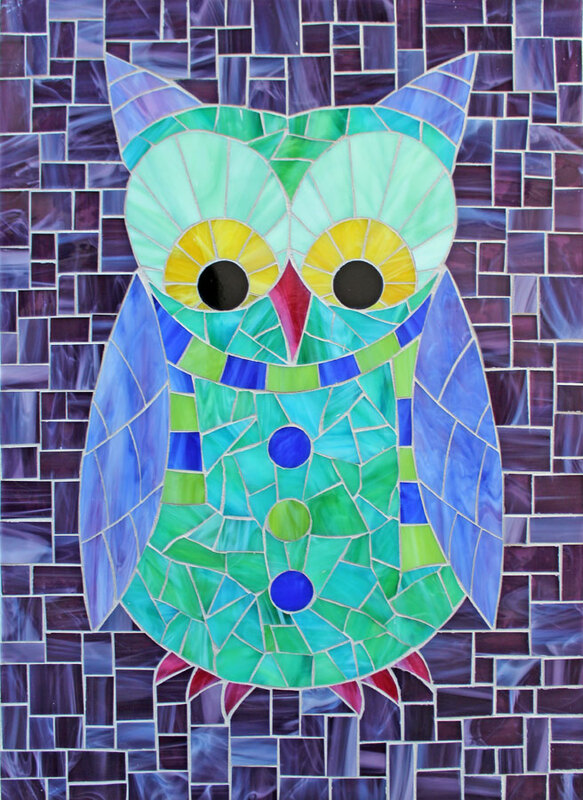 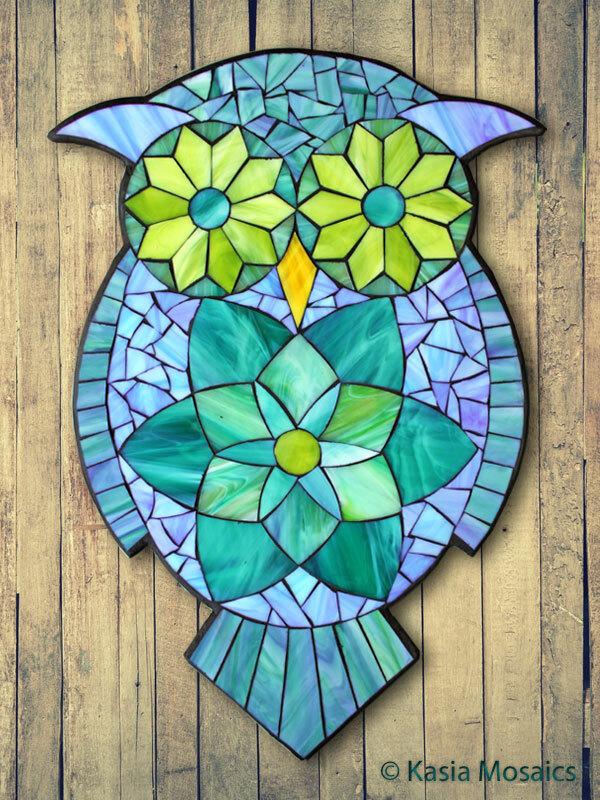 Besides precision cutting for stained glass mosaics which is demonstrated in each owl design, the class explores various background patterns that can be added to each of the 8 mosaic owl templates. 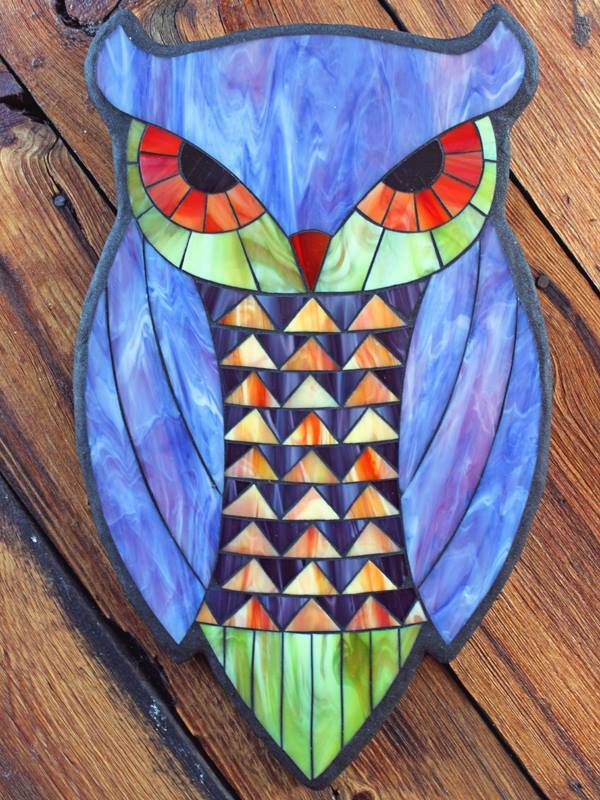 This Online Owl Class is an ideal opportunity for people who are looking for a creative outlet and to pick up new techniques while learning in the comfort of their own home. Create one of or all 8 owl designs included in Kasia's virtual workshop. 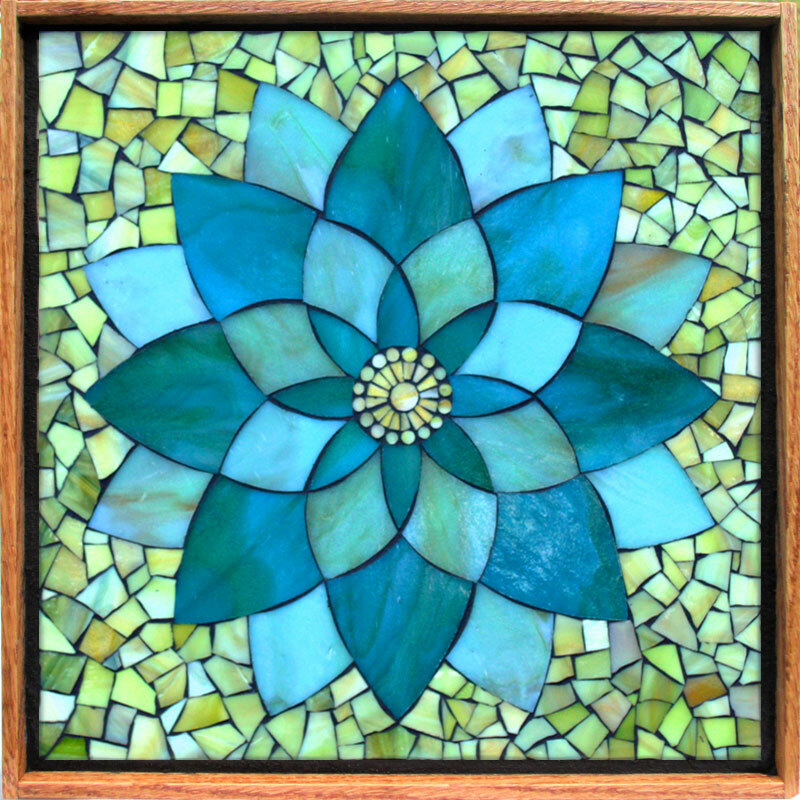 The class is well suited for complete beginners to intermediate mosaics. Learn to use hand tools to cut and shape glass, to arrange a glass mosaic using the front mounting tape technique, to add background patterns, to glue and to grout. 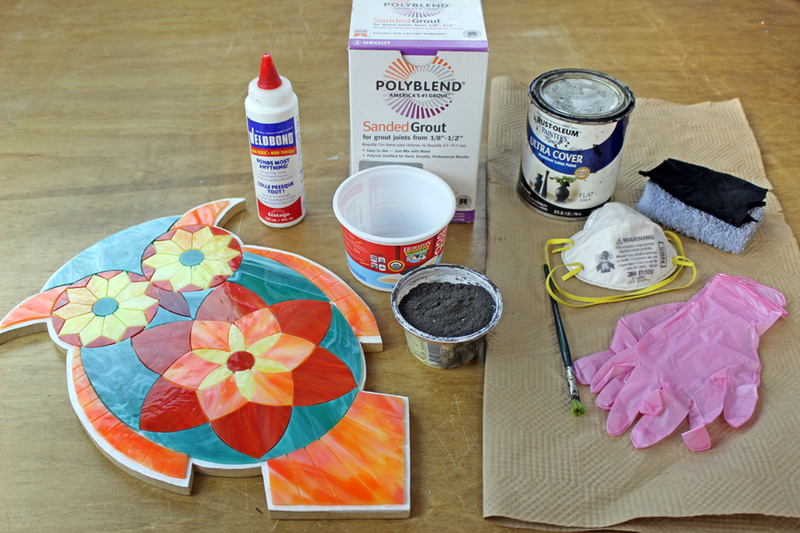 Learn about substrates, adhesives and grouts for both indoor as well as outdoor projects. 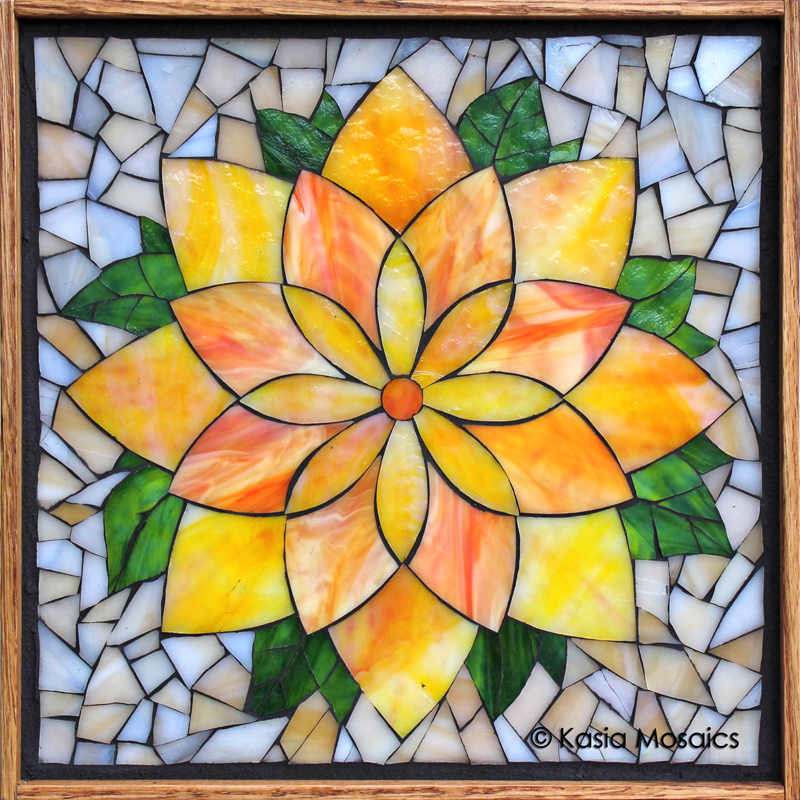 Here is the fully virtual version of the popular Kasia Mosaics Online Stained Glass Flower Class is LIVE! 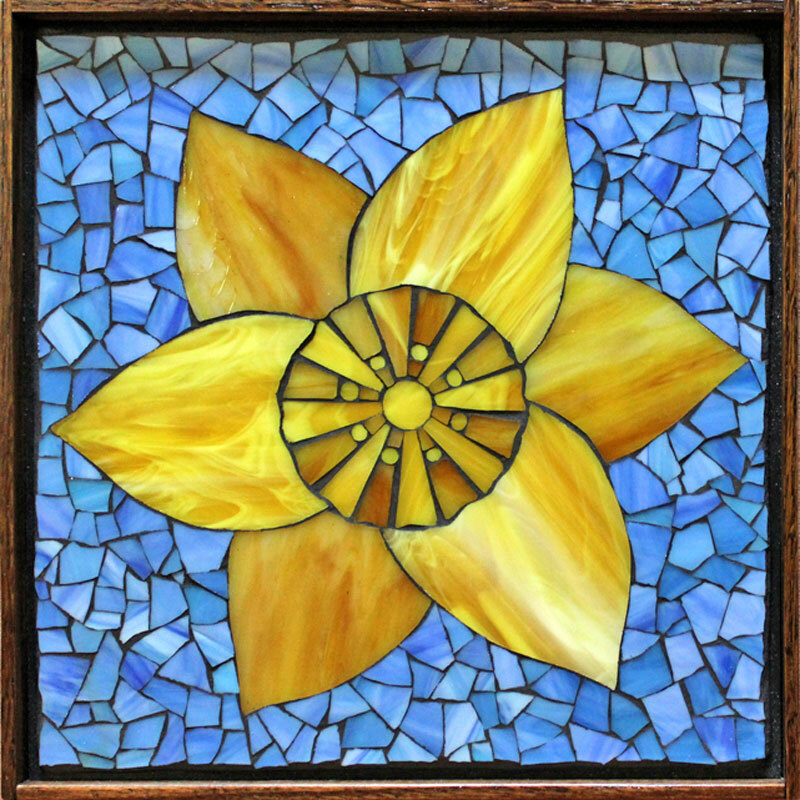 It is available to students worldwide and can be accessed by registered students from anywhere, anytime. 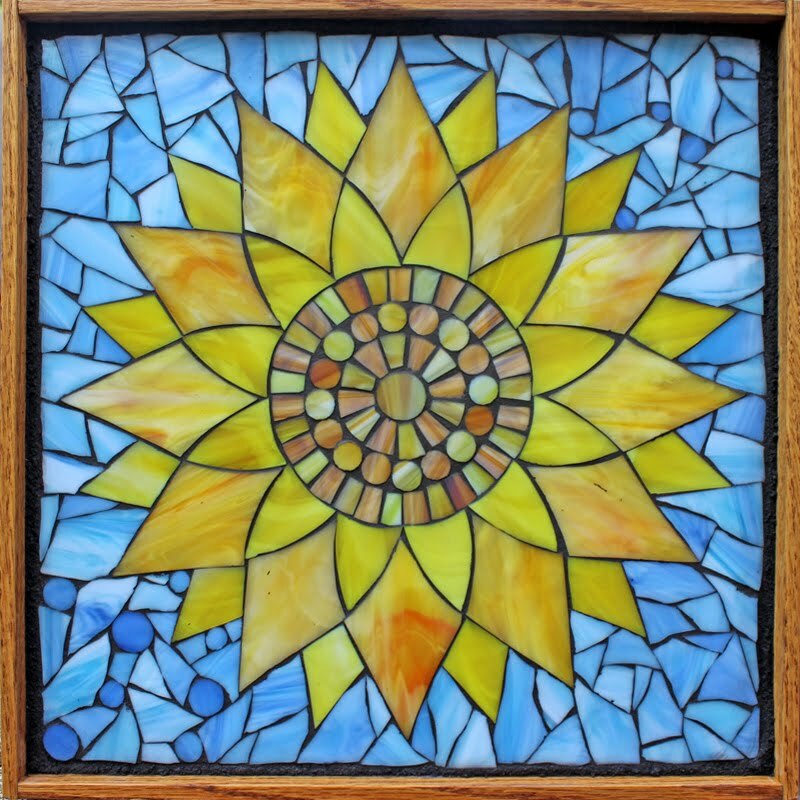 There is no time limit on how often you can watch the videos and no set time on when you need to start or complete your project. 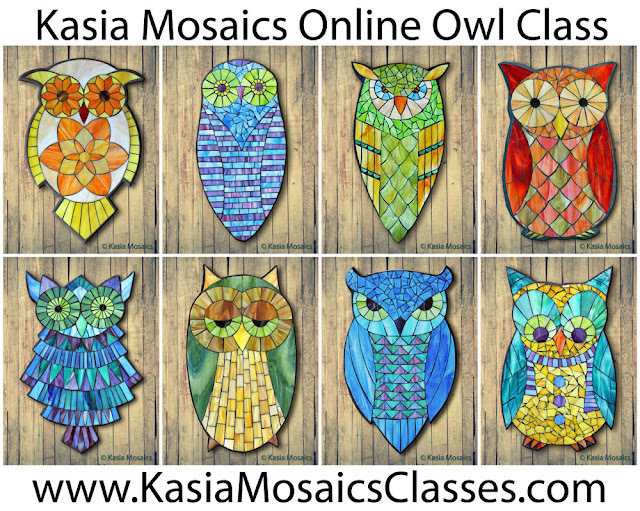 Visit the new Kasia Mosaics Classes Website to sign up for the Online Class. 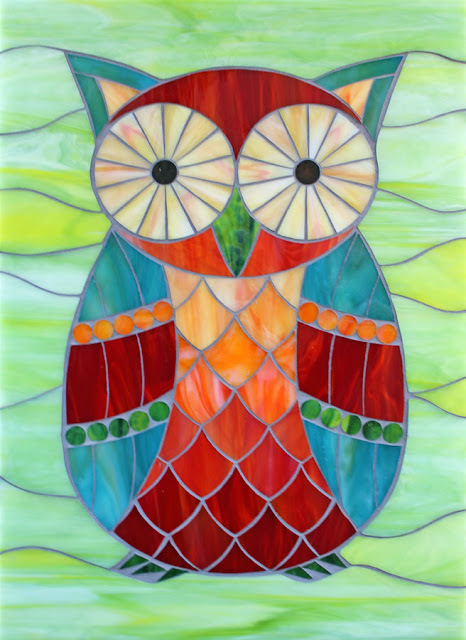 The online class is suited for all levels – a beginner as well as an advanced student will enjoy and benefit from the class. 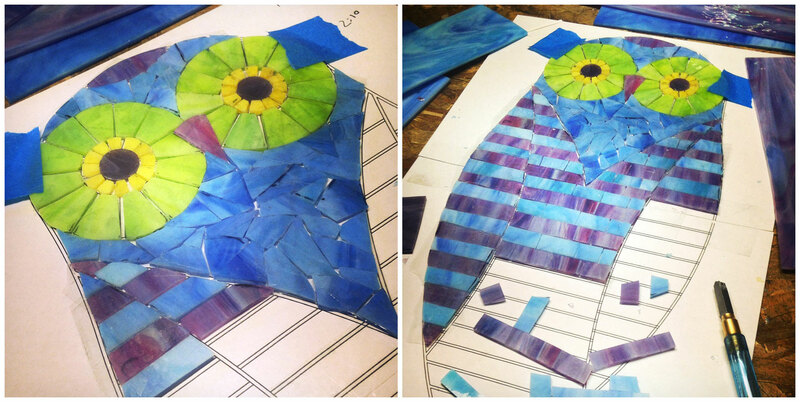 No prerequisites or drawing skills are needed to be able to successfully complete the class project. 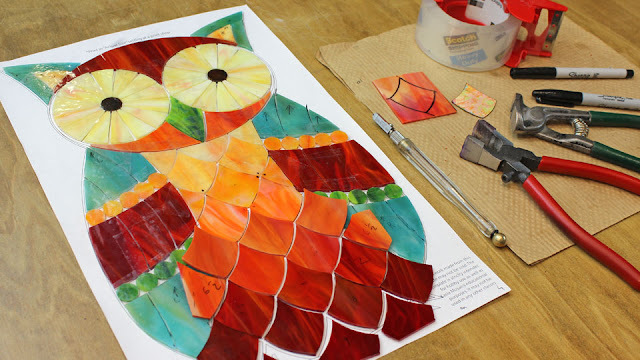 The class covers the basics of every step of the stained glass mosaic process from start to finish. 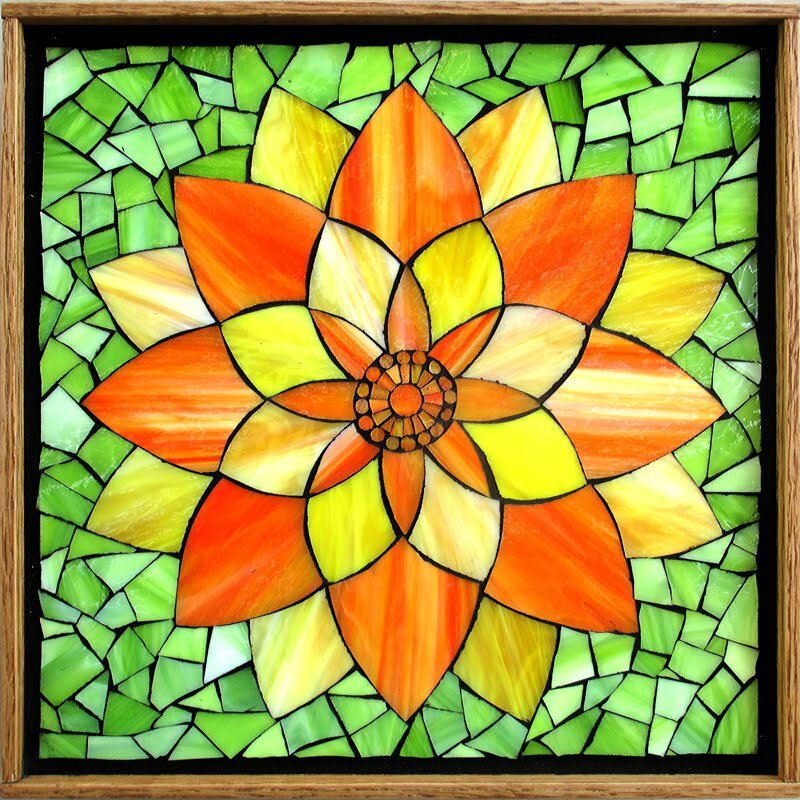 It is a great choice for someone looking to develop a strong foundation in stained glass mosaics and to grow as a stained glass mosaic artist. 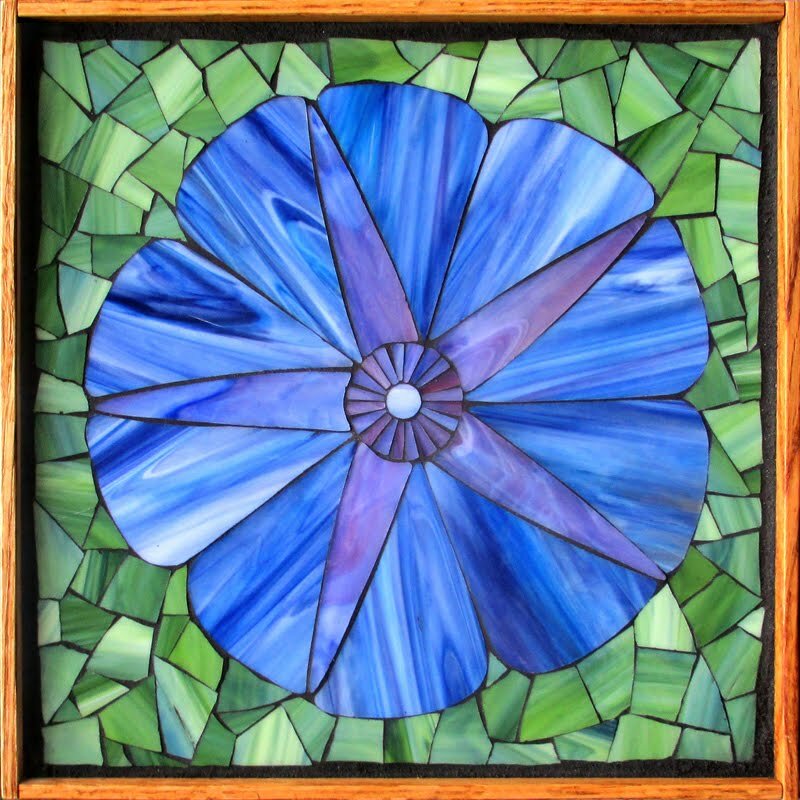 With unlimited access to the class materials, learn in the comfort of your own home/studio while creating a beautiful stained glass mosaic flower. 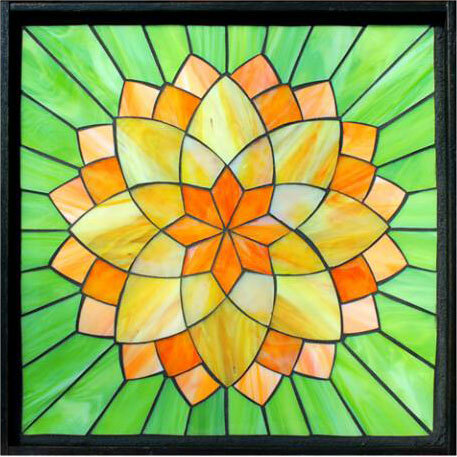 Learn how to score, break and shape stained glass with hand tools – no need to spend money on grinders and wet saws. 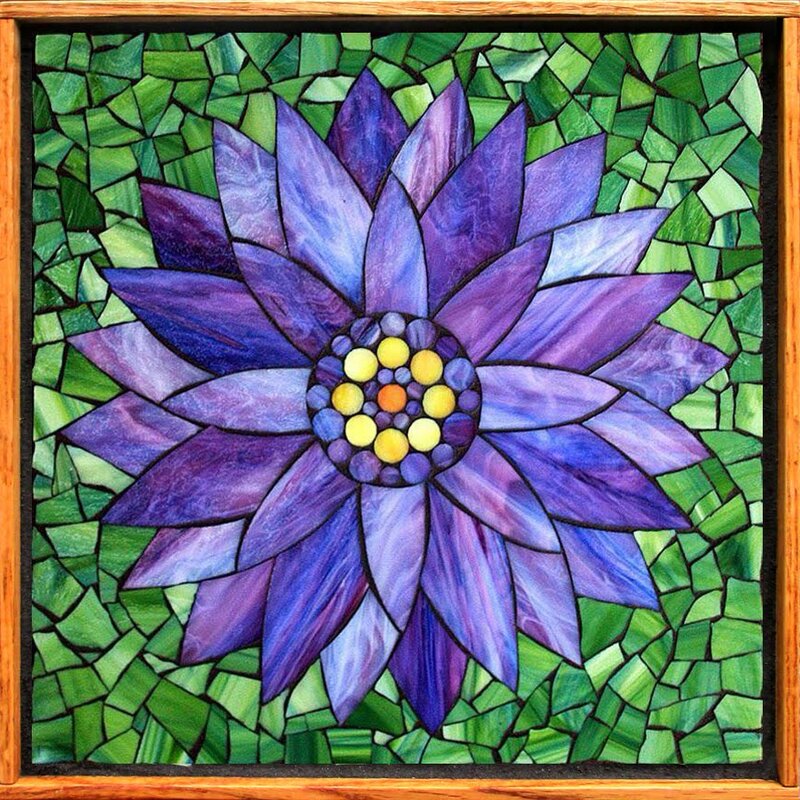 You don’t need to know how to draw to create a mosaic via this Online Class as it comes with a full set of flower designs that may be used for a variety of hobby projects. 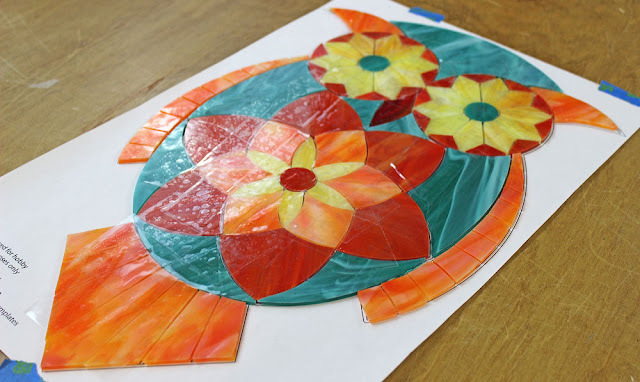 The additional flower designs allow you to continue practicing your new skills following the completion of their first class mosaic without having to worry about the design aspect of creating a mosaic in these early stages of learning. 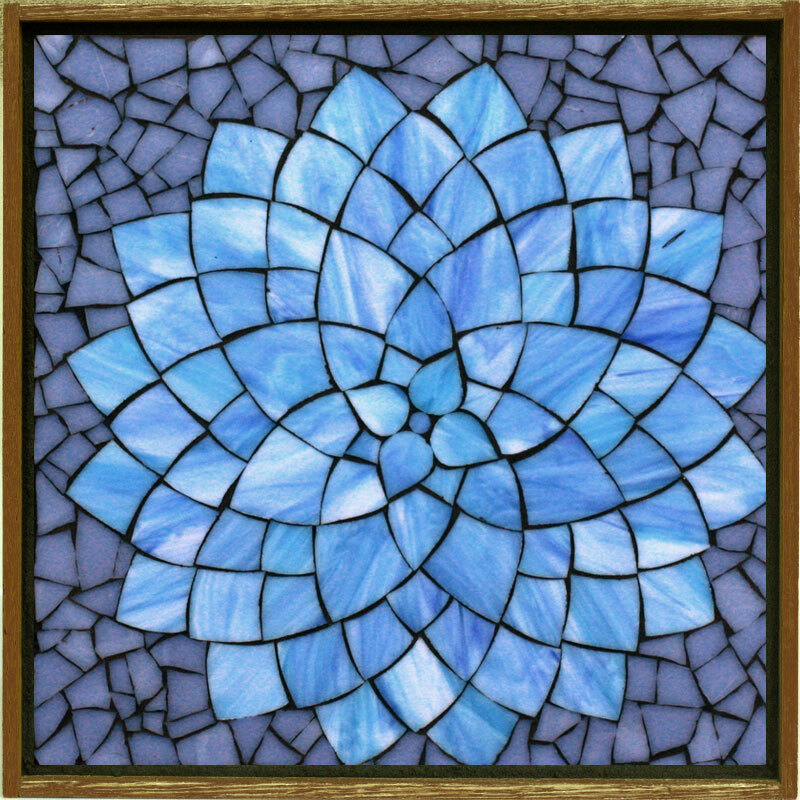 The techniques covered in class can be further applied to more complex projects down the line after you build a strong foundation through practicing the lessons covered in class. You will have access to a private Kasia Mosaics Online Class Facebook Group. 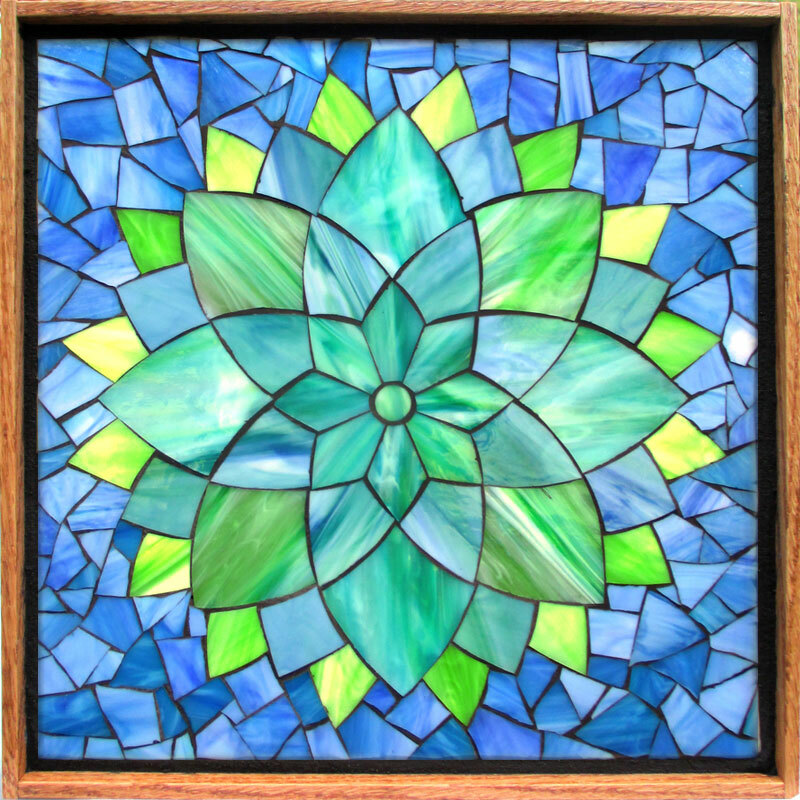 This is where you get to ask questions, share your progress, interact with other students who are taking the class and be inspired by their results. 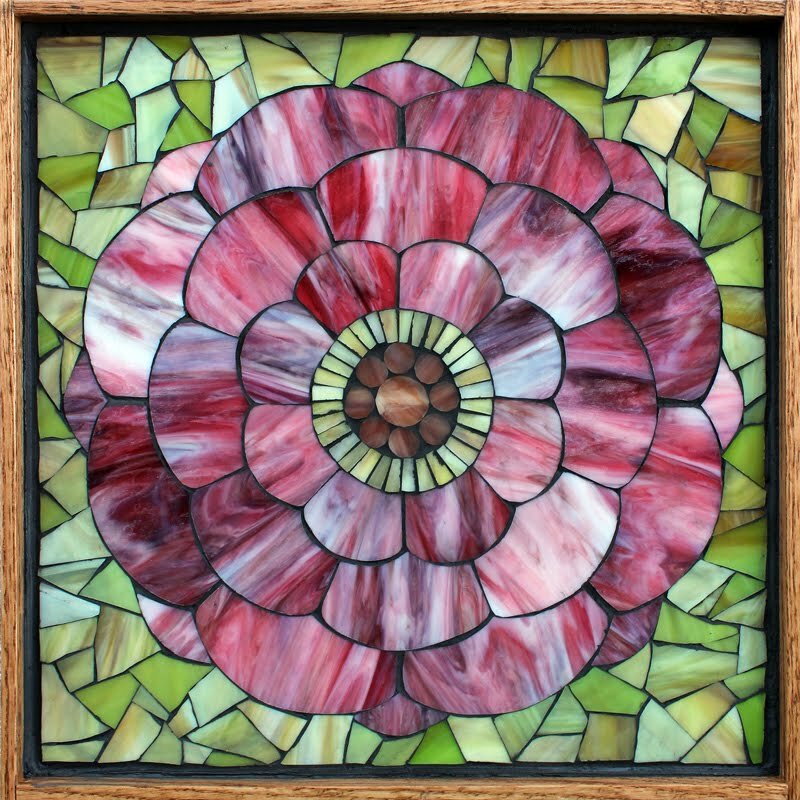 The class project makes a beautiful accent for your home or an artful gift for a special someone. 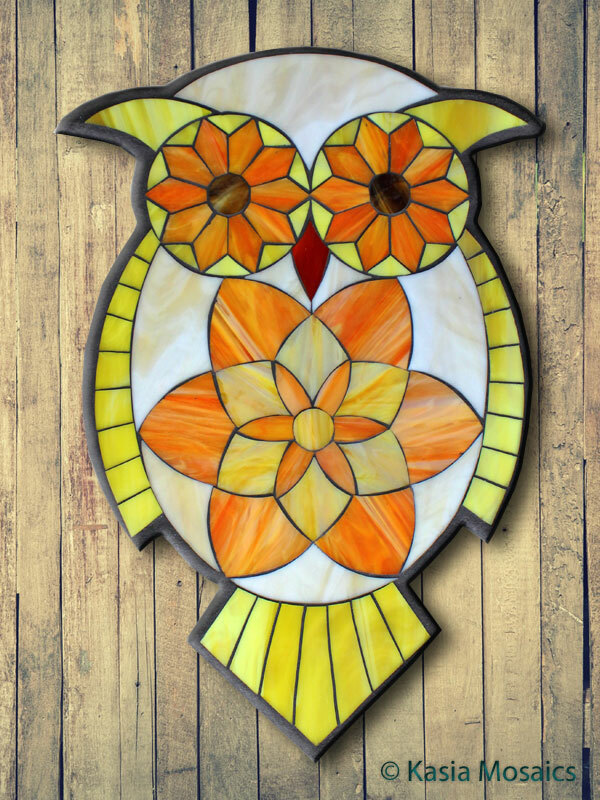 You have the option to purchase additional project templates, kits and frames. 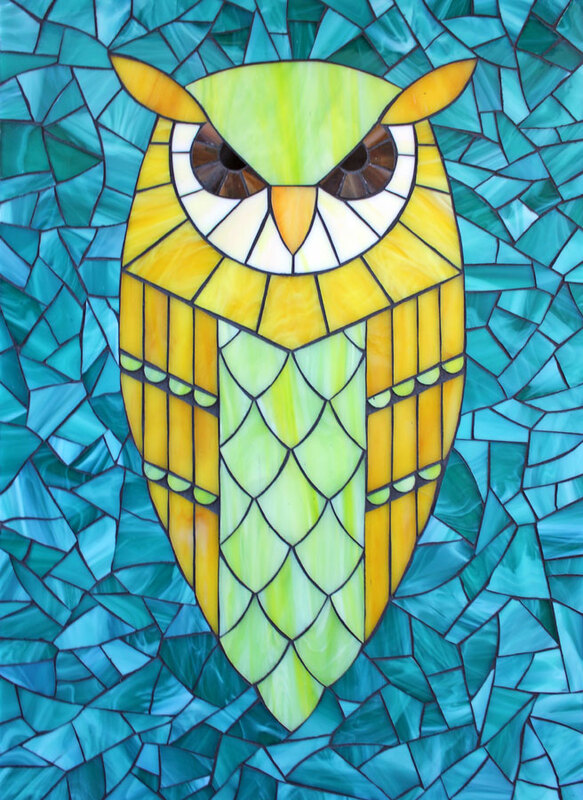 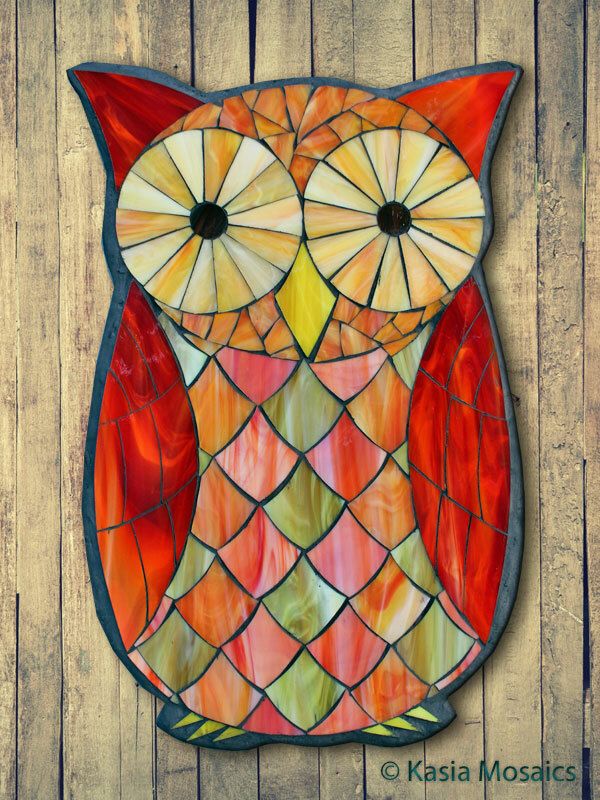 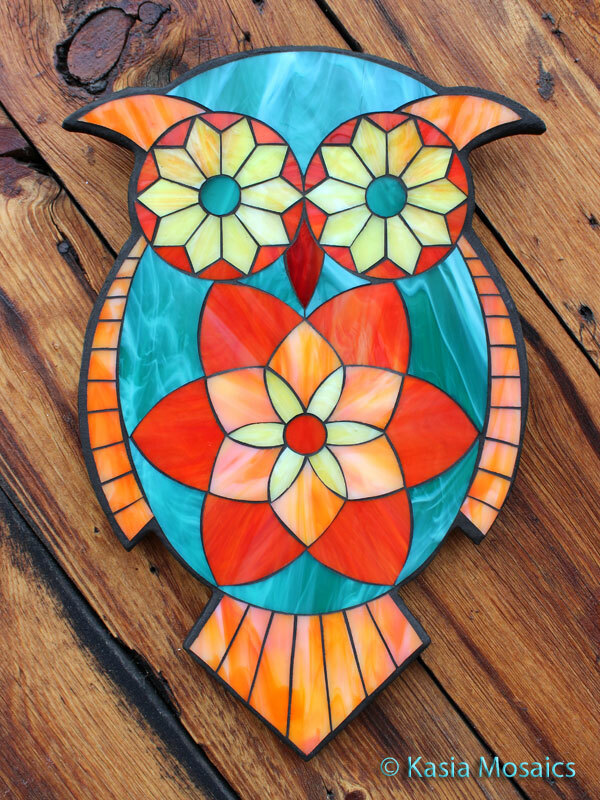 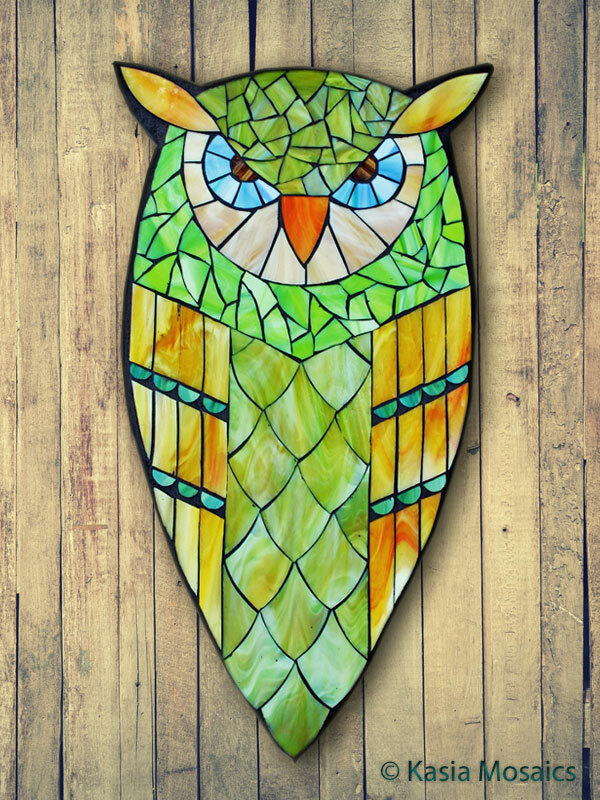 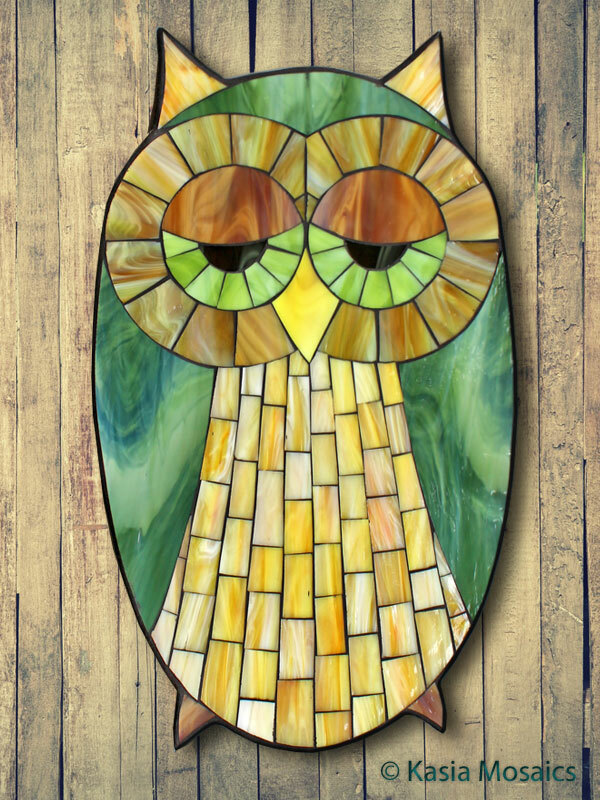 This online workshops comes with a full set of owl templates, full instruction for the entire Stained Glass Mosaic Process from start to finish, additional owl design tutorials, background pattern tutorials, information on substrates, adhesive and grout for both indoor and outdoor mosaics and more! 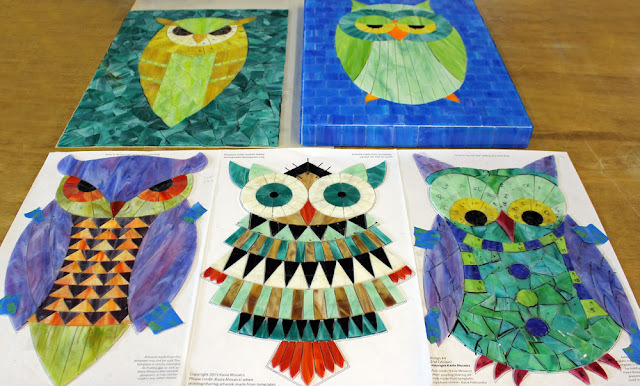 All students will be invited to a private facebook learning group where they can interact, ask questions and post photos of their class projects. 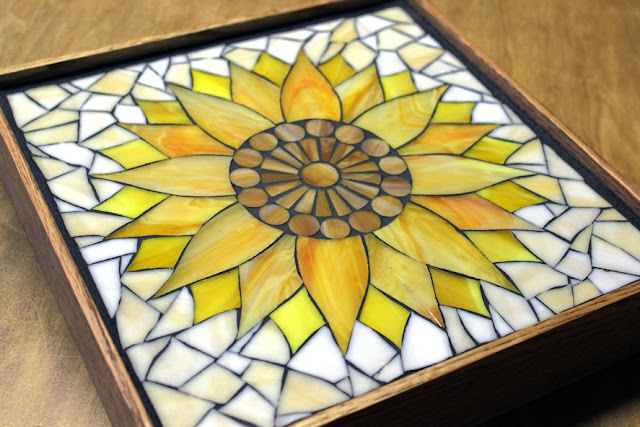 Learn how to approach your first mosaic art project, how to cut stained glass using simple and affordable hand tools and how to use the versatile taping technique. Learn how to glue your project and how to choose the right substrate for you mosaic. 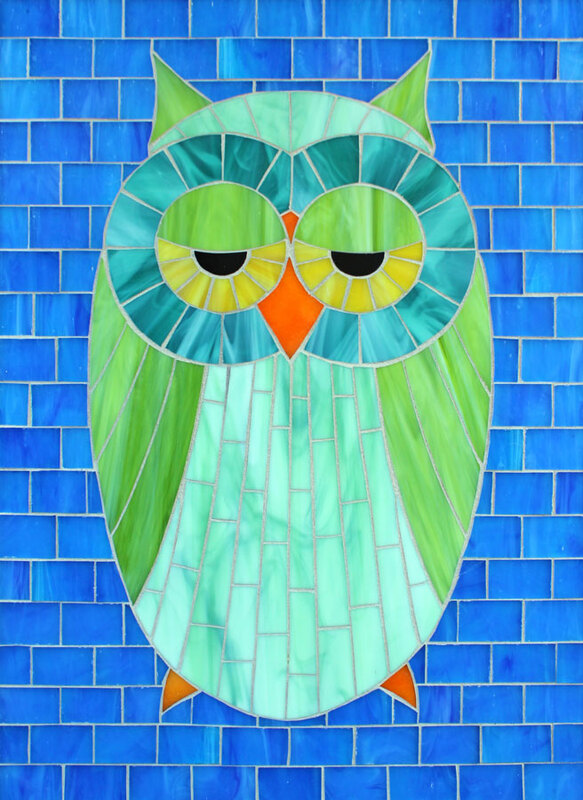 Learn to easily grout your mosaic project. Learn to create beautifully beveled edge that will give a clean, finished look to any mosaic project! 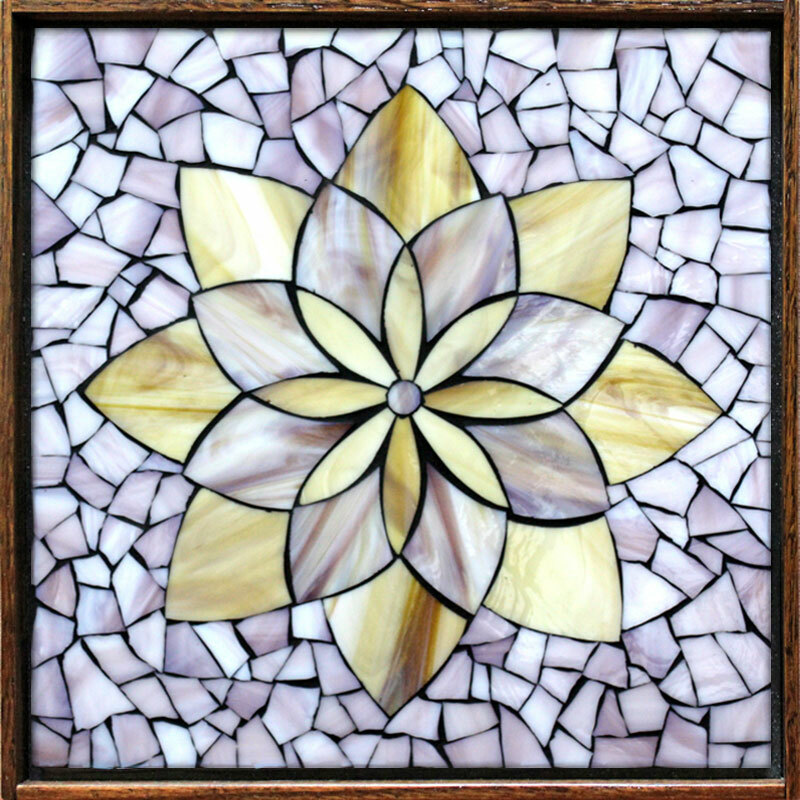 I've recently added the latest tutorial for the students in my Online Stained Glass Mosaic Flower Class. It is a 30 minute tutorial specifically for Design 11 also know as a Daisy Flower - there are 12 designs in total for the students to download and to use for their fun, learning projects. The tutorails and the templates are only available to registered students. The video specifically focuses on the petals of the flower which due to having continuous curves that make a sharp turn make these cuts more challenging. 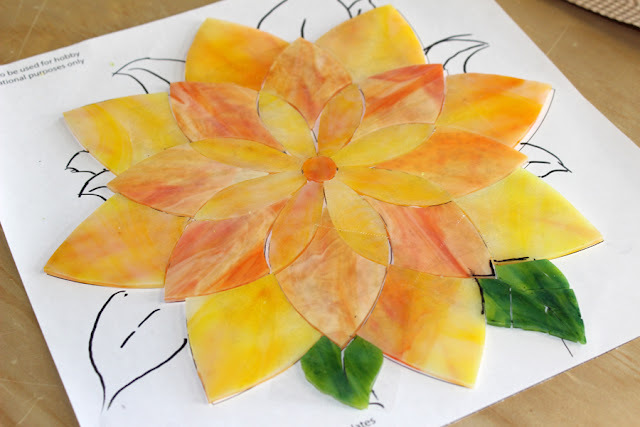 This template is a bonus for those students who have created at least one of the other flower designs, have practiced cutting glass and feel confident using the tools. 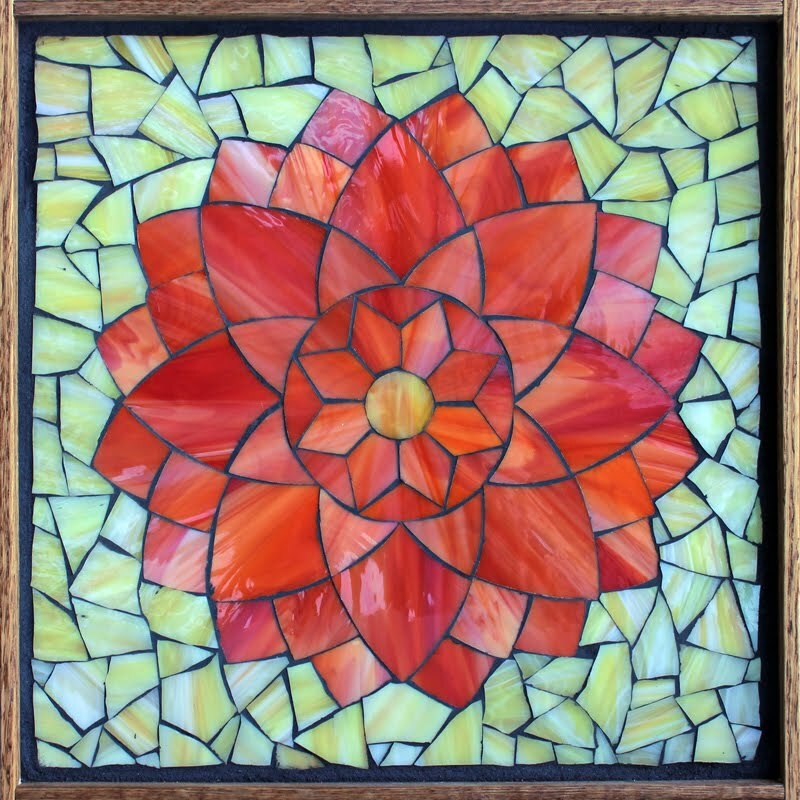 Check out the Online Class Promo Video to get a quick glimpse into what this class entails. 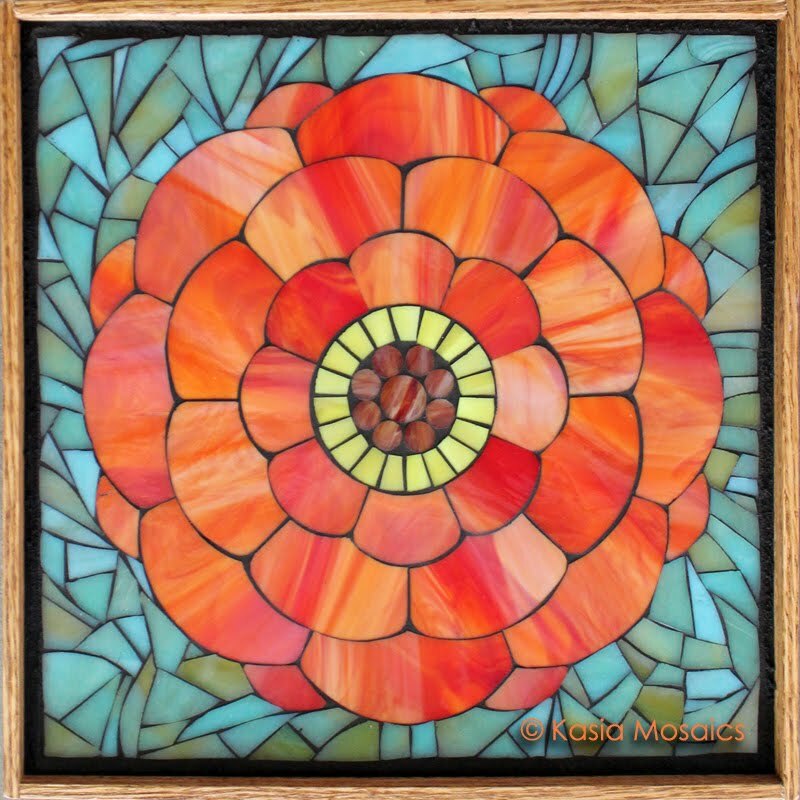 This is one of the designs I've created for my online class: Online Stained Glass Mosaic Flower Class which focuses on my approach to stained glass mosaics. 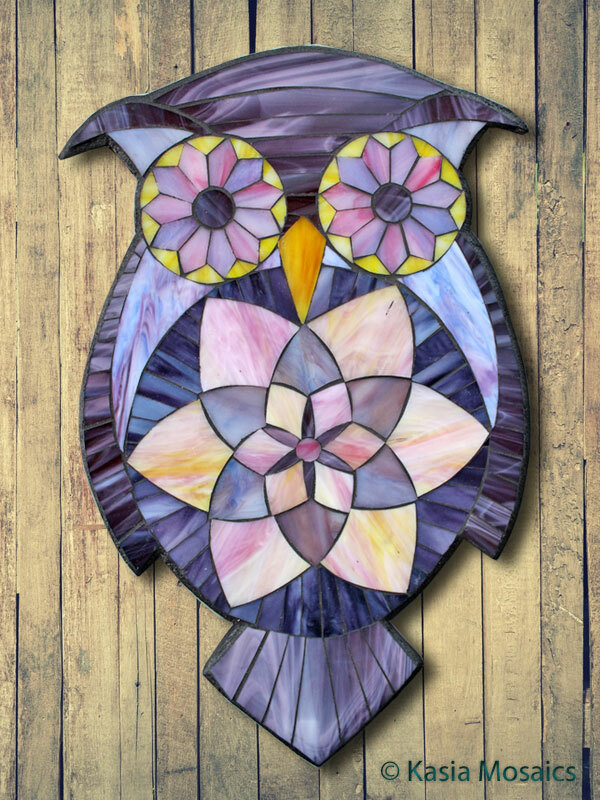 The class is geared at beginners as well as anyone wanting to try a new technique or simply to get an opportunity to work on some of the designs I've created for this class. 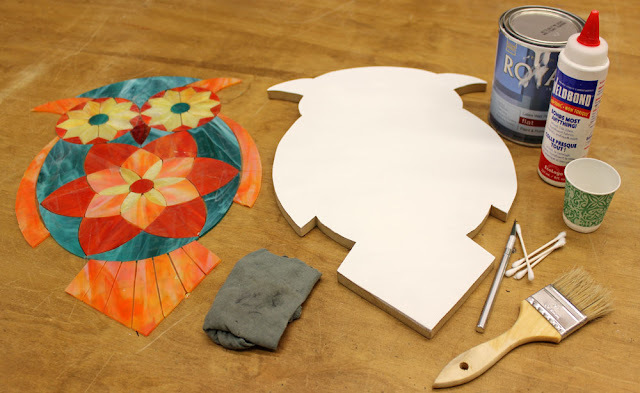 Additionally the students also get to participate in a private facebook learning group where they get to post photos of in-progress projects as well as finished ones and ask questions along the way. 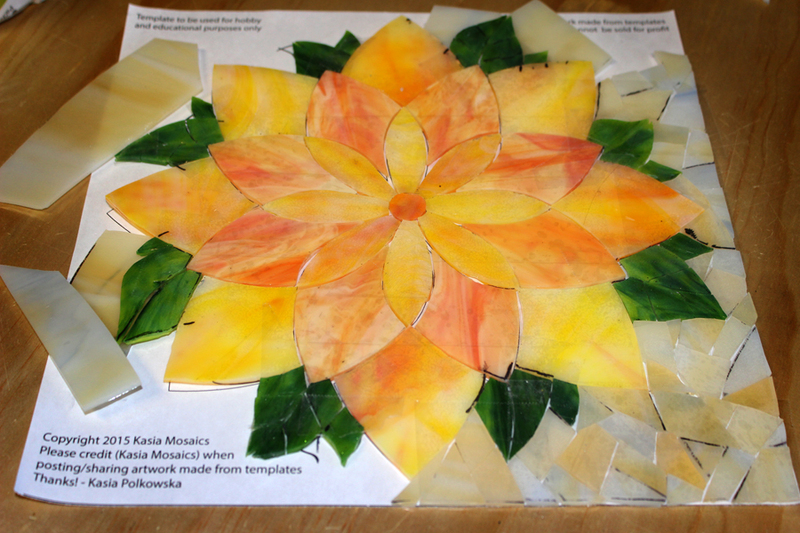 Adding leaves - each leaf is hand cut by me. 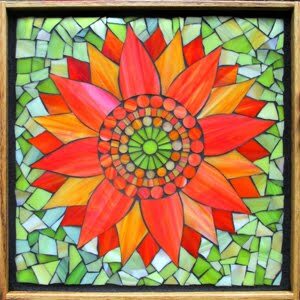 Included in the class are 12 flower pattern downloads. 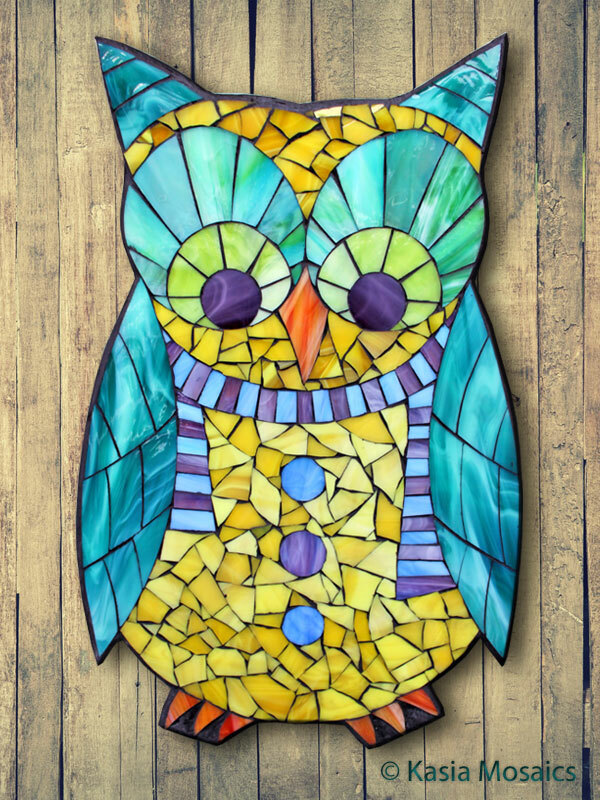 Additionally each one has an added background pattern option which makes this a total of 24 templates that students get to use during their learning process. 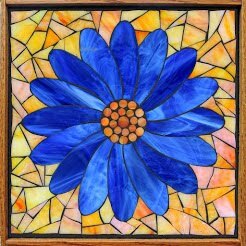 A set of finished mosaic flowers will make an impressive display at home or wonderful and unique gifts for loved ones. 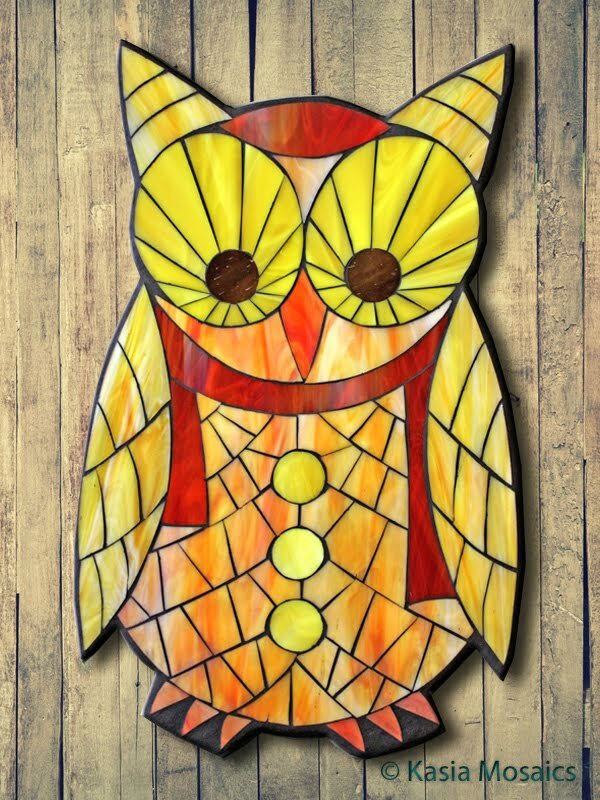 Working on the background. 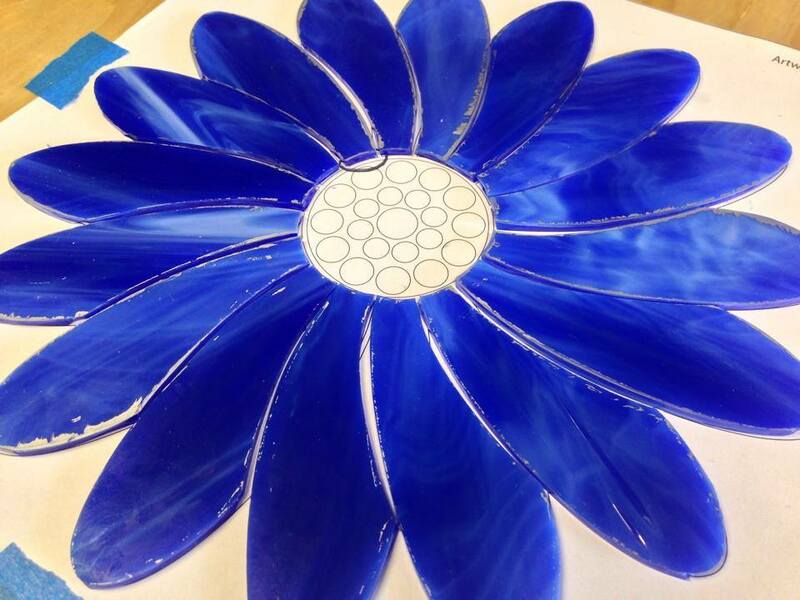 Each piece is hand cut and fitted. 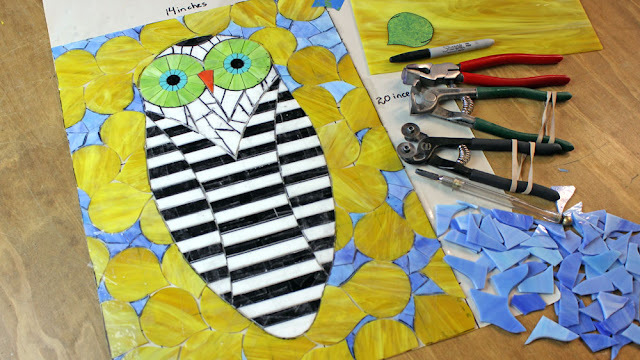 In the class the students get to experience the whole stained glass mosaic process from start to finish at their own pace in the comfort of their home. I demonstrate how to use the four basic glass cutting tools: a glass scoring tool, running pliers, flathead tile nippers and wheeled nippers while teaching the students how to cut glass for mosaics. I give many demos including showing how to use my taping technique, how to glue and grout. 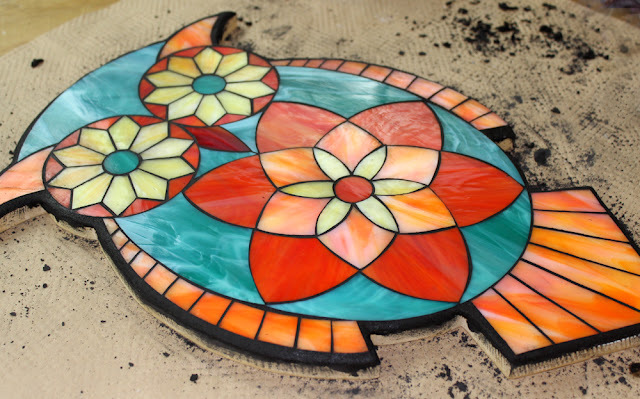 The mosaic is glued into a custom oak frame built by my partner Kyle. Additionally I've recently began adding new demos where I give special tips on each design. 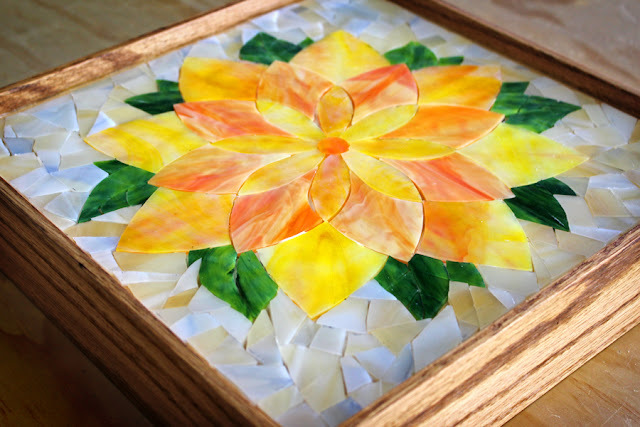 The above flower was created by me while demonstrating how to cut each flower petal as well as how to add leaves to this flower. This can be applied to any of the included flower designs. 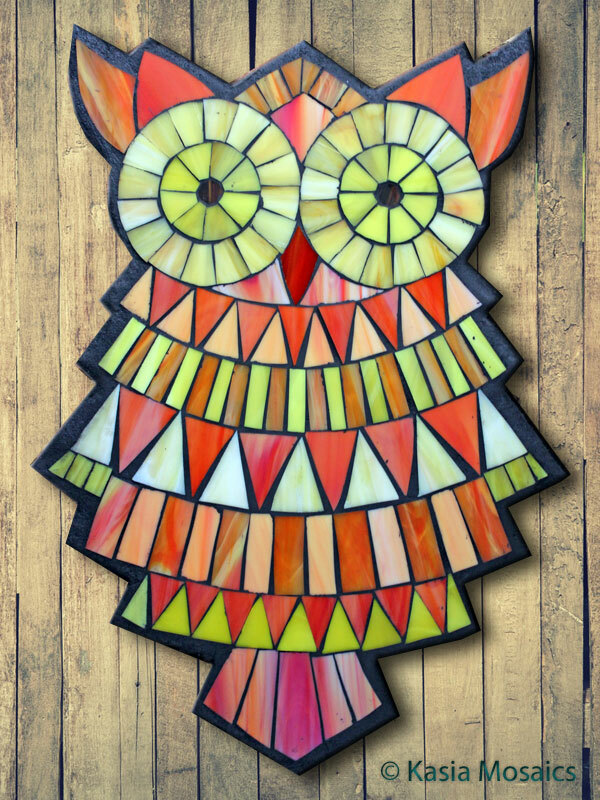 I am a Polish born artist (b. 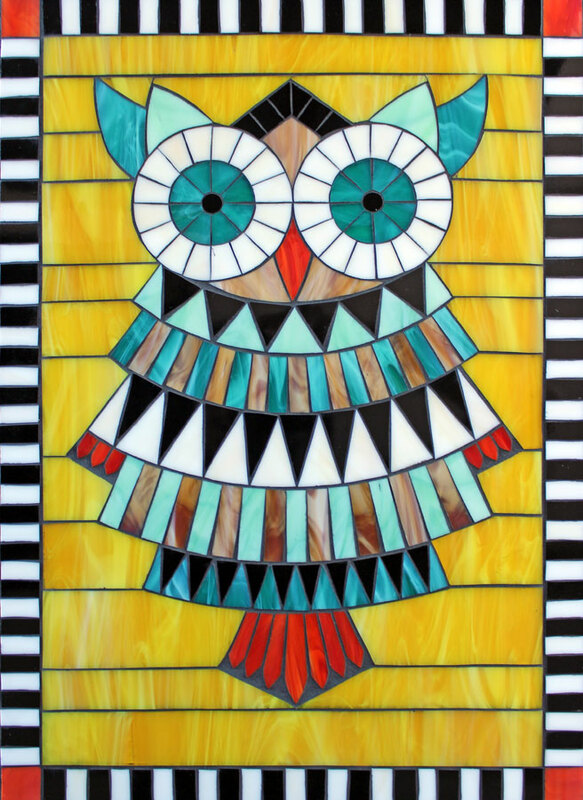 1983 Warsaw, Poland). 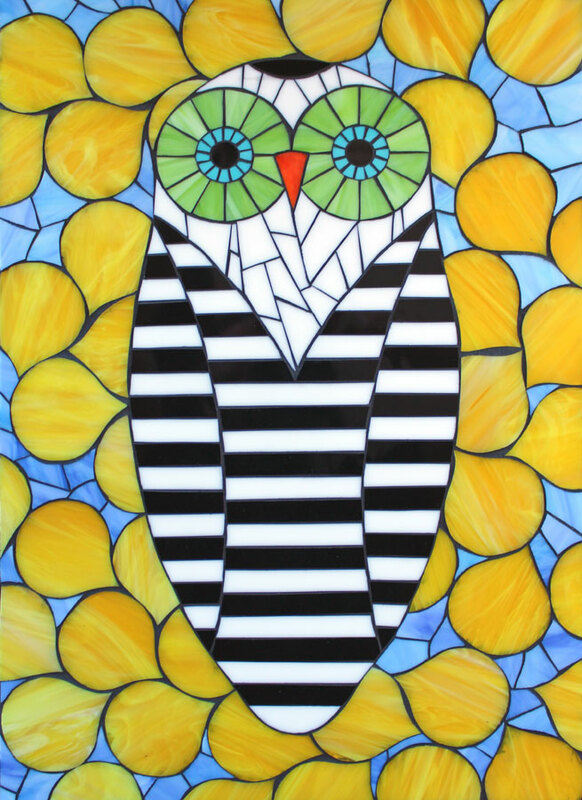 I graduated from Pratt Institute in Brooklyn, New York in 2006 with a BFA in Painting. 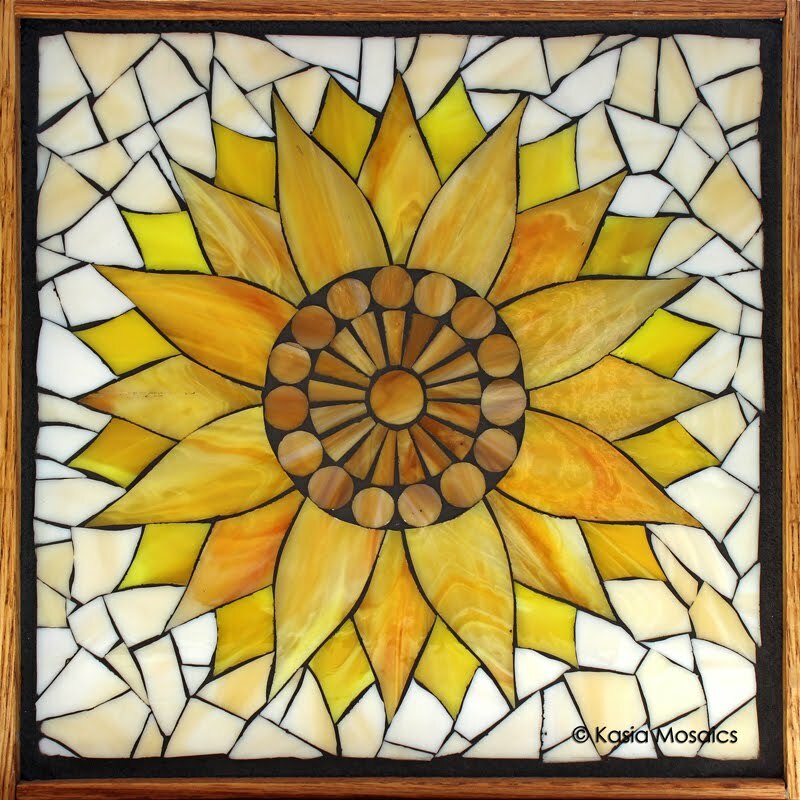 Currently I am living and working in Alamosa, Colorado where I am a full time artist. 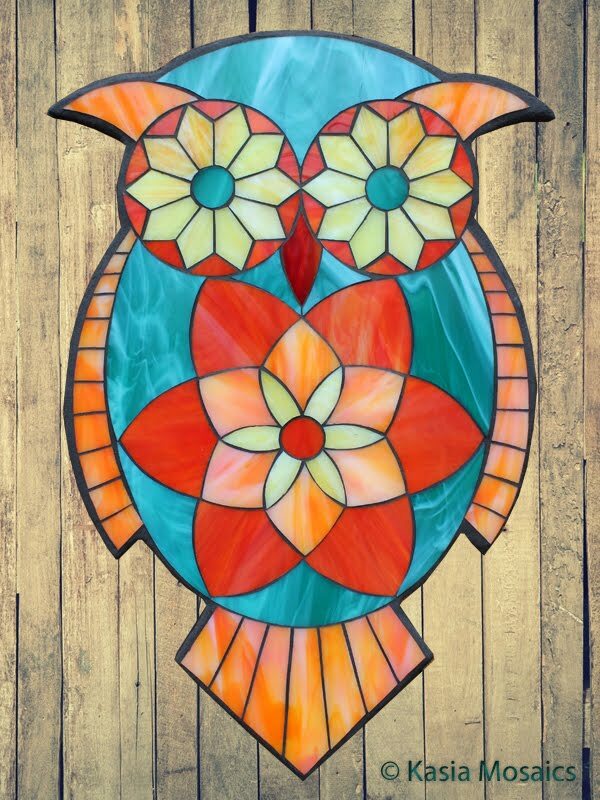 Please refer to my Bio and CV for more info.